"Immigrant Song" is a 1970 song by the English rock band Led Zeppelin. It is built upon a repeating riff and features lyrical references to Norse mythology, with singer Robert Plant's howling vocals mentioning war-making and Valhalla. The song was included on their third studio album, Led Zeppelin III and released as a single. Several live recordings have also been issued on various Led Zeppelin albums. Other artists have recorded renditions of the song or performed it live. Though Led Zeppelin is regarded as an album-oriented group, "Immigrant Song" is one of the band's several hit singles. The song's popularity has led to its inclusion in such compilation albums as Led Zeppelin Remasters (1990) and Early Days: The Best of Led Zeppelin, Vol. 1 (1999). We weren't being pompous ... We did come from the land of the ice and snow. We were guests of the Icelandic Government on a cultural mission. We were invited to play a concert in Reykjavik and the day before we arrived all the civil servants went on strike and the gig was going to be cancelled. The university prepared a concert hall for us and it was phenomenal. The response from the kids was remarkable and we had a great time. 'Immigrant Song' was about that trip and it was the opening track on the album that was intended to be incredibly different. Six days after Led Zeppelin's appearance in Reykjavik, the band performed the song for the first time in concert during the Bath Festival. The song begins with a distinctive, wailing cry from Plant and is built on a repeating, staccato riff by guitarist Jimmy Page, bassist John Paul Jones, and drummer John Bonham. It is performed in the key of F♯ minor at a moderate tempo of 112 beats per minute. There is a very faint count-off at the beginning of the track with lots of hiss which appears on the album version, but is trimmed from the single version. The hiss is feedback from an echo unit. A phrase from the song was used as the title of Stephen Davis' biography of the band, Hammer of the Gods: The Led Zeppelin Saga. The lyrics also did much to inspire the classic heavy metal myth, of Viking-esque figures on an adventure, themes which have been adopted in the look and music of bands such as Iron Maiden, Saxon, Manowar and Amon Amarth. "Immigrant Song" is one of Led Zeppelin's few releases on the 45 rpm single format. It was issued in the United States on 5 November 1970 by Atlantic Records and reached number 16 on the Billboard Hot 100. First pressings of the US single have a quote from Aleister Crowley inscribed in dead wax by the run-out groove: "Do what thou wilt shall be the whole of the Law." The Japanese single included "Out on the Tiles" as the B-side. In a contemporary review of Led Zeppelin III, Lester Bangs of Rolling Stone described "Immigrant Song" as the closest to being as classic as "Whole Lotta Love", praising the song's "bulldozer rhythms and Plant's double-tracked wordless vocal crossings echoing behind the main vocal like some cannibal chorus wailing in the infernal light of a savage fertility rite." 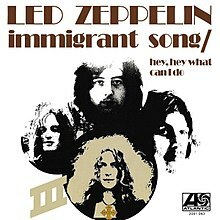 "Immigrant Song" was used to open Led Zeppelin concerts from 1970 to 1972. On the second half of their 1972 concert tour of the United States, it was introduced by a short piece of music known as "LA Drone", designed to heighten the sense of anticipation and expectation amongst the concert audience. By 1973, "Immigrant Song" was occasionally being used as an encore, but was then removed from their live set. Live versions of the song can be heard on the Led Zeppelin albums How the West Was Won (featuring a performance at Long Beach Arena in 1972) and the Led Zeppelin BBC Sessions (a version from the Paris Theatre in London in 1971). When the song was played live, Page included a lengthy guitar solo, which was absent on the recorded Led Zeppelin III version. "Immigrant Song" was played as part of the 2009 Rock and Roll Hall of Fame induction ceremony for Jeff Beck by both Page and Beck. Note: The official UK Singles Chart incorporated legal downloads as of 17 April 2005. ^ Hulett, Ralph; Prochnicky, Jerry (2011). Whole Lotta Led: Our Flight With Led Zeppelin. Kensington Publishing Corp. p. 114. ISBN 978-0-8065-3555-5. However, the opener, "Immigrant Song," set a standard for medieval imagery of Viking lust in hard rock. ^ "The 40 Greatest Led Zeppelin Songs of All Time: 7 – 'Immigrant Song' (1970)". Rolling Stone. 7 November 2012. Retrieved 8 November 2014. ^ Popoff, Martin (2003). "Immigrant Song". The Top 500 Heavy Metal Songs of All Time. ECW Press. p. 76. ISBN 978-1-55022-530-3. ^ Curtis, James M. (1987). Rock Eras: Interpretations of Music and Society, 1954–1984. Popular Press. p. 292. ISBN 978-0-87972-369-9. ^ a b Erlewine, Stephen Thomas. "Led Zeppelin – Early Days: The Best of Led Zeppelin, Vol. 1". AllMusic. Retrieved 10 September 2015. ^ Erlewine, Stephen Thomas. "Led Zeppelin – Led Zeppelin Remasters". AllMusic. Retrieved 10 September 2015. ^ Welch, Chris (1994). Led Zeppelin. London: Orion Books. p. 55. ISBN 1-85797-930-3. ^ Lewis, Dave; Pallett, Simon (1997). Led Zeppelin: The Concert File. London: Omnibus Press. pp. 50–51. ISBN 0-7119-5307-4. ^ Fricke, David (2008). Led Zeppelin Mothership. Alfred Publishing Co. p. 81. ISBN 978-0-7390-5317-1. ^ a b c d Lewis, Dave (1994). The Complete Guide to the Music of Led Zeppelin. Omnibus Press. ISBN 0-7119-3528-9. ^ Wall, Mick (2010). When Giants Walked the Earth: A Biography of Led Zeppelin. St. Martin's Press. p. 138. ISBN 978-1-4299-8561-1. ^ Daniels, Neil (2016). Iron Maiden – Updated Edition. Voyageur Press. pp. 23–26. ISBN 978-0-7603-5254-0. ^ "Led Zeppelin III (Led Zeppelin) Easter Egg - Alastair Crowley in the Dead Wax". Easter Egg. Retrieved 25 February 2011. ^ Bangs, Lester (26 November 1970). "Led Zeppelin III". Rolling Stone. Retrieved 13 August 2017. ^ "Forum – ARIA Charts: Special Occasion Charts – CHART POSITIONS PRE 1989". Australian-charts.com. Hung Medien. Retrieved 8 November 2014. ^ "Go-Set Australian charts – 6 March 1971". Go-Set. Retrieved 8 November 2014. ^ "Austriancharts.at – Led Zeppelin – Immigrant Song" (in German). Ö3 Austria Top 40. Retrieved 8 November 2014. ^ "Top RPM Singles: Issue 3741." RPM. Library and Archives Canada. Retrieved 8 November 2014. ^ "Immigrant Song – Led Zeppelin". Danske Hitlister. Retrieved 1 April 2016. ^ "Offiziellecharts.de – Led Zeppelin – Immigrant Song". GfK Entertainment Charts. Retrieved 8 November 2014. ^ "Top 100 Singles – 25 January 1971" (in Japanese). Oricon. Retrieved 19 January 2009. ^ "Nederlandse Top 40 – Led Zeppelin - Immigrant Song" (in Dutch). Dutch Top 40. Retrieved 8 November 2014. ^ "Dutchcharts.nl – Led Zeppelin – Immigrant Song" (in Dutch). Single Top 100. Retrieved 8 November 2014. ^ Scapolo, Dean (2007). "Top 50 Singles – May 1971". The Complete New Zealand Music Charts (1st ed.). Wellington: Transpress. ISBN 978-1-877443-00-8. ^ "South African Rock Lists Website SA Charts 1969 – 1989 Acts (L)". Rock.co.za. Retrieved 8 November 2014. ^ "Swisscharts.com – Led Zeppelin – Immigrant Song". Swiss Singles Chart. Retrieved 8 November 2014. ^ "Led Zeppelin Chart History (Hot 100)". Billboard. Retrieved 8 November 2014. ^ "CASH BOX Top 100 Singles – Week ending JANUARY 9, 1971". Archived from the original on 18 September 2012. . Cash Box. ^ "The Singles Chart" (PDF). Record World. 16 January 1971. p. 27. ISSN 0034-1622. Retrieved 17 September 2017. ^ "RPM 100 Top Singles of '71". RPM. 8 January 1972. Retrieved 21 May 2016. ^ "Jaaroverzichten – Single 1971" (in Dutch). Single Top 100. Hung Medien. Retrieved 8 November 2014. ^ "Led Zeppelin Songs – Top Songs / Chart Singles Discography". Musicvf.com. Retrieved 17 January 2009. ^ "December 1, 2007 – Rdio". Billboard. Prometheus Global Media. Retrieved 2 February 2014. ^ "British single certifications – Led Zeppelin – Immigrant Song". British Phonographic Industry. Retrieved 13 April 2018. Select singles in the Format field. Select Silver in the Certification field. Type Immigrant Song in the "Search BPI Awards" field and then press Enter.